This article describes the initial tweaks you might make to a newly-installed Bodhi system. These include setting up your date/time, keyboard (if you live outside the US), selecting a theme that suits your tastes, changing the wallpaper and managing startup applications. To make further changes, follow the links at the end of this article; they lead to other Bodhi Wiki articles describing how to configure shelves, iBars, and virtual desktops, how to set up key bindings/edge bindings and change the default system language. The Swami Control Panel is an effective GUI based tool for changing system settings (startup commands & applications/date/time/keyboard/etc). To open the Swami Control Panel tool – navigate to Menu -> Applications -> System Tools -> System Settings. Upon opening System Settings, you should be greeted with the Swami Control Panel. Go to Menu > Applications > System Tools > System Settings > Date and Time to open the Date and Time dialog box. From here you may select Sync from Internet (NTP – Network Time Protocol), Edit Date and Time, and Change Timezone. Be sure to hit Apply Changes when you have completed your changes. If you do not live in the USA, you may need to adjust your keyboard settings. Go to Menu > Applications > System Tools > System Settings > Keyboard Layout to open the Keyboard Layout dialog box. Click your language from the list and hit Apply Selected. Moksha themes control the appearance of your desktop and its various components, including shelves, menus, icons, and dialog boxes. If you wish to change the default theme that greets you on a new installation, go to Menu > Settings > Theme; this opens the Theme Selector dialog box – click System. 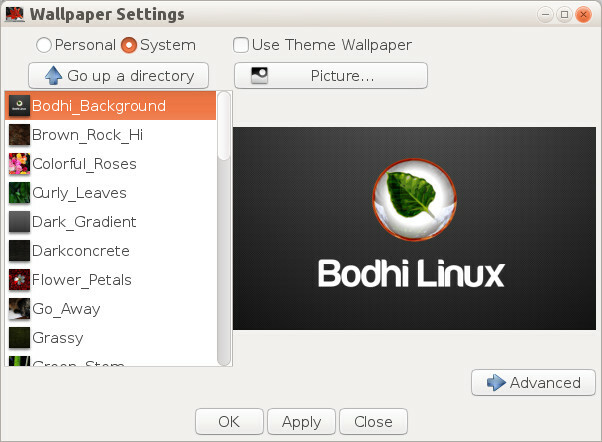 A list of themes available on your system will be displayed – in a new Bodhi 3.x installation, the only theme is ‘default‘. However, Bodhi 4.x includes a few more themes as well as the default. More themes are available at the AppCenter. When you download these, they will be automatically added to the System category in this dialog box. To try a theme, simply highlight it in the list and click Apply, then check how the shelf and the menus look. Try others, and when you have made your final choice click OK. Note: Moksha themes do not control the appearance of application windows, i.e. such things as their scroll bars and menus. GTK themes control these, and ideally you should select a GTK theme that matches your chosen Moksha theme. To do this, go to Menu > Settings > Settings Panel > Look > Application Theme to open the Application Theme dialog box and make your choice. 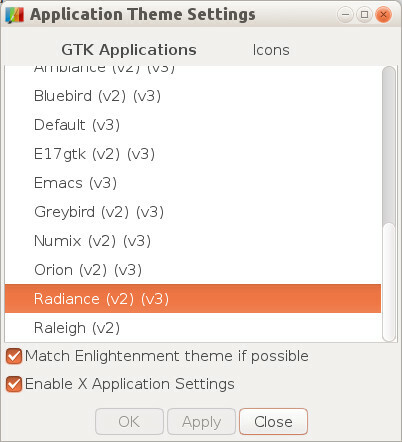 For example, if you have chosen the Radiance Moskha theme, choose the GTK theme of the same name. If you wish to try other GTK themes to see how they look, select them at this dialog box, click Apply, then open an application (such as your file manager) and check the appearance of its scroll bars and menus. Click OK at your final choice. To change the wallpaper, go to Menu > Settings > Wallpaper; this opens the Wallpaper Settings dialog box, where you can choose a wallpaper from the list or click Use Theme Wallpaper to apply the wallpaper provided by the theme. Bodhi Linux offers both GUI based (Swami Control Panel) and command line based ways to add and remove programs from Startup Applications, configure Date and Time, Keyboard Layout and Light DM. This area will let you add programs to your startup via GUI with a double click and remove programs in the same manor. Be sure to hit apply after making changes. Startup Applications lists programs that are already in your startup. Other Applications lists other applications that may be added to your startup. 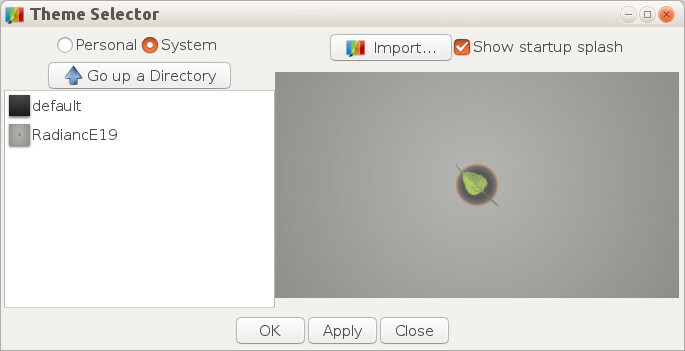 Near the bottom of the panel is an option for Startup Commands – this button allows your to enter “raw” commands to run at startup. This area will assist your with setting various system settings. The Sync from Internet button will help you run NTP (network time protocol). Edit Date and Time will allow you to manually configure your date and time settings. Simply select your keyboard layout from the drop-down menu and click Apply Selected. Use this area to set guest access, autologin-user, autologin-user-timeout and autologin–session. Be sure to hit Apply or Save Changes within each sub-menu when your changes are completed or hit Back if your are not satisfied with your changes. Language packages should have been installed when you correctly specified your location during the installation process, but you need to tell Moksha which language to use. Follow this link to change your default language. This article has described only a tiny fraction of the multitude of configuration settings that you might apply to your new Bodhi installation. Moksha is a tweaker’s paradise, and the articles listed below will introduce you to further possibilities. Now that you have configured your new Bodhi installation, are you ready to add some sweet software? Click here to learn how or click here to see what software is available in our AppCenter!